Map #1 - "Fort Ancient" is the archaeologic name for this tribe which existed from 1000 AD to the mid- 1700's. Map #2 - The earliest explorers, such as Samuel de Champlain, did not meet the Fort Ancient. Rather he learned of the their existence from the Huron, who called the Fort Ancient people, Attiouandaron....which means "people who speak almost the same language". The Huron also called the Chonnonton (in southern Ontario) Attiouandaron. From this, we can deduce that the Fort Ancient people were Iroquois, but that Attiouandaron was not their tribal name. Map #3 - Half a century later, the name "Tionontatecaga" filtered to the outside world. This name is almost the same as the Ontario Iroquois Petun name, Tionontate, and thence is a star candidate for the true name of this tribe. 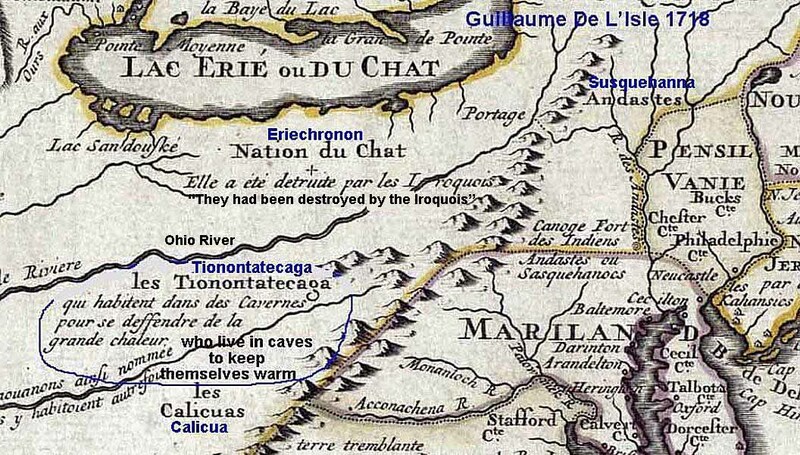 Map #4 - This map indicates that the Tionontatecaga were living caves to keep themselves warm. This indicates a refugee situation.